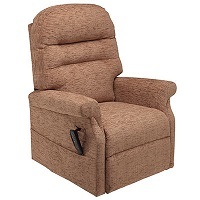 Riser recliner chairs combine the features of recliner chairs and riser chairs, including seat tilt, seat lift and tilt and recline. They can be manually operated or powered by mains electricity. They can have single, dual or multiple motors for chairs needed for heavy duty use. 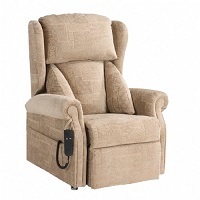 You normally require about 460mm (18") to 600mm (24") behind both recliner and riser recliner chairs so the chair can fully recline, otherwise the motors could burn out pushing against an obstruction. There are now some compact versions available called 'wall huggers' which have reduced the space required to about 100mm (4"). 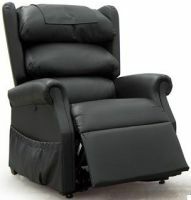 Some powered models have a key or a detachable handset that can be removed when the chair is not in use, and some have sensors which stop the movement of the chair to prevent entrapment of pets or children however currently there are only a few manufacturers that include this as a standard feature. Many of the products listed are CE marked as a 'medical device' which means they should be used only in accordance with the manufacturer's intended purpose. The manufacturer's of these chairs intend them to be used for sitting, they are not sold as sleeping systems. 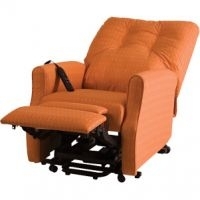 Consequently it is not advisable for these riser recliners to be used for sleeping unless a decision is made as part of a risk assessment by an Occupational therapist or a Physiotherapist. There are chair beds available which are designed for sitting and sleeping. The Medicines and Healthcare products Regulatory Agency (MHRA) is the government agency responsible for ensuring CE marked products are fit for purpose and safe. It may be important that you have an individual assessment as there are many factors that may affect what is appropriate for you. You may be eligible for an assessment and equipment from your local authority. If you are eligible the equipment will be provided on a long-term loan basis. Alternatively, you may be eligible for a direct payment from your local authority to purchase something suitable. View more information on equipment provision via your local authority and the direct payments scheme. 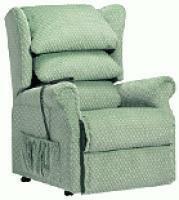 Rica have a useful guide about choosing a riser recliner chair. It includes a table of chairs with different lifting options available, including tilt, high, low and vertical lift. 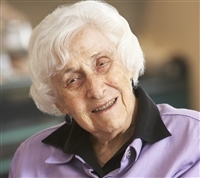 They are an independent consumer research charity providing free, practical and unbiased reports for older and disabled people.